Glentoran’s growth under manager Gary Smyth will face the greatest test tonight as league leaders Linfield attempt to increase control in the title race with a fourth derby victory of the campaign. Smyth stepped in as a replacement for Ronnie McFall following the worst run of league results in Glens history - with the club legend helping rebuild morale and momentum thanks to back-to-back league wins. Marek Cervenka during a training session following his loan switch to Linfield until the end of the season from Czech Republic club FK Teplice. Pic by Pacemaker. Now the Glens visit bitter rivals Linfield aiming to extend that encouraging league form against a Blues squad out to increase the league lead to six points with a 13th consecutive triumph across all competitions. 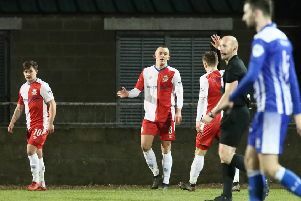 The run of seven league games in a row without conceding a single goal includes a 4-0 derby rout on Boxing Day but Smyth draws confidence from the previous two ‘Big Two’ outings, alongside the recent league wins over Newry City AFC and Institute. “Until Boxing Day, the two games previous could have gone either way,” said Smyth on the club’s official YouTube account. “In the first league game they’d one meaningful shot on target and we’d two chances with headers, so very little in it. “The County Antrim Shield tie went into extra-time at Windsor Park, over the 90 minutes we were the better team then maybe ran out of steam and they were better in extra-time. “I would take the two performances of the first two games, obviously with a different outcome the dream. Linfield boss David Healy is relishing the test. A delay in international clearance may prevent Linfield’s latest signing, Marek Cervenka, from a ‘Big Two’ derby debut. The 26-year-old striker has joined Linfield on loan from Czech Republic-based FK Teplice until the end of the season. “Marek was with us for a week earlier this month and he impressed in training,” said Healy on the club website. “He also impressed in a behind-closed-doors game. “Marek will strengthen our squad and increase our striking options, as we look ahead to a number of huge games in the coming weeks.